Microsoft said Tuesday that it's begun rolling out its Clutter inbox tool to Office 365 business accounts, providing an intelligent layer of filtering to weed out email that isn’t quite spam, but not really all that useful, either. 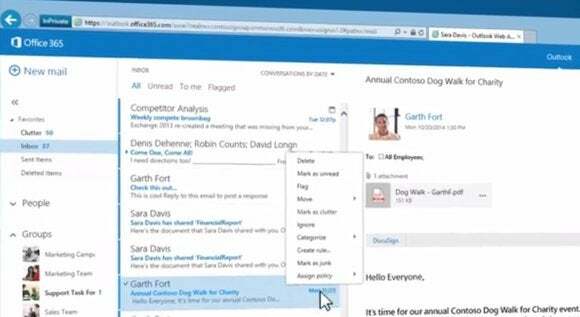 When Microsoft announced Clutter at the end of March, the tool seemed intended exclusively for Outlook Web App (OWA), the Web-based version of Outlook. Now it looks like Clutter will also be accessible via OWA for devices, the standalone Office 365 Outlook app, or Exchange-connected devices, Microsoft said. So what’s Clutter? It’s like a slightly less restrictive spam filter. Put simply, Microsoft defines clutter as messages you might not really need to know about: a toy drive in a remote office, for example, or the reply-all's to company announcements that everyone is forced to endure. When your business will receive Clutter depends in part on whether your IT administrator has opted in to the First Release option, which allows those businesses to receive new Microsoft features right away. Otherwise, you’ll have to wait until Clutter works its way through the standard release channels by the end of November. If you do have Clutter enabled, however, you’ll need to turn it on using the OWA options menu (look for the gear icon in the upper righthand corner). Unlike email rules you set up (for example, to route all email with “travel” in the subject header to a dedicated folder), Clutter uses what Microsoft calls the Office Graph to send email intelligently to the Clutter folder. You can “teach” Clutter which files are clutter by dragging those emails to the Clutter folder, or you can right-click the email within the OWA app to identify it as clutter. According to a Microsoft spokeswoman, you'll need to turn on Clutter within OWA. But the folder itself will appear within the Outlook Office 365 app itself, she confirmed. Clutter won’t delete the emails it collects. Just as you need to purge your inbox regularly to reach the mythical “inbox zero,” you’ll need to manage your Clutter folder—checking it for important emails and deleting the rest. Ideally, however, that will take just a few seconds. Why this matters: Any sort of automated assistance to cut down on email management should be welcomed. Still, we’ve probably all “received” an important email that’s been automatically routed to our spam folder, only to discover the error later. Clutter sounds like a good idea, but it’s going to need to earn your trust. Updated at 12:22 PM with additional details.